People who enter the skilled labor job market are sometimes advised to look for employment before seeking formal career training programs because employers provide on the job training. However, on-the-job training is not offered at all the companies you may want to apply to, and it’s not guaranteed to be more comprehensive than training at a trade school. Here are a few more reasons why training at a trade school or career college may create better opportunities for you than relying on on-the-job training. When people are accepted into on-the-job training programs, they are taught only the skills they need to accomplish the particular task assigned to them. They may not even have a complete understanding of why it is done this way or what alternatives there are for the chosen method. While workers may become adept at the tasks they’re given, they only have the chance to develop a narrow skillset. On the other hand, trade schools teach students a broader variety of skills that they need to be successful in the position in general, not just for a particular company. As a result, students have a broader knowledge base to draw from and have a better grasp of how to handle tasks. This is especially useful if they have to troubleshoot problems that arise. Their added experience and more comprehensive knowledge allow them to tackle those challenges more effectively. On-the-job training represents a serious investment to employers. While it is expected that there will be some adjustment as new employees adapt to a company’s particular system of operation, on-the-job training entails more in-depth instruction. When job candidates come to employers already knowing the skills they need to know to complete the job at hand, they become much more attractive. Trade school students have the advantage of demonstrated skill and experience, so they are already able to demonstrate the quality of their work before they are hired. This represents both a safer and a more cost-effective investment for employers. While mentors assigned to people in on-the-job training programs may be excellent workers in their own right, they may not necessarily be the best instructors. Teaching is a skill of its own. Often on-the-job instruction is taught by workers who are trying to manage their own responsibilities at the same time, and it can be hard for them to give trainees the adequate attention they need to learn as fully as they should. Training may also be rushed, given in abrupt spurts, or demonstrated in a way that passes on bad habits. The result is a worker with an incomplete grasp of the skills needed to perform the job. However, students who first attend a trade school are taught by not only industry professionals, but professional instructors. Students in career colleges are able to benefit from both a teacher’s industry experience as well as the teacher’s professional skills so they have the best understanding and training they can get. Because students learn from an organized curriculum, the vocational training they receive is easier to process, retain, and put toward practical use. 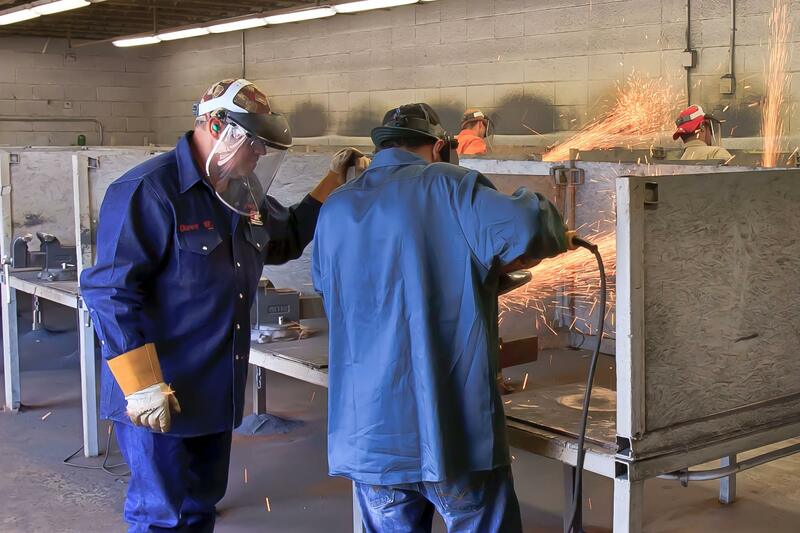 For more information about what advantages Florida or Oklahoma trade schools can offer you as you look for a career in the skilled trades, contact a Tulsa Welding School Admissions Representative.